Sweet Floweret: 20 Minute Tuesday!!! I had bought a wreath and doilies at the dollar store with plans of making an ever popular burlap wreath like everyone else in creative blog land ;) I made up my own since I didn't see any that could be done in a quick amount of time. 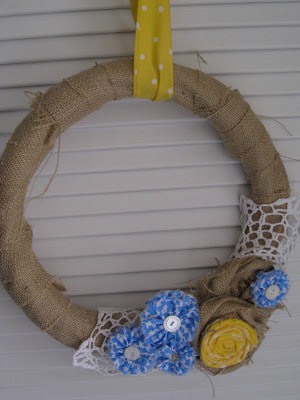 I cut the burlap that I had into three inch wide strips and wrapped it around the wreath. I kept cutting strips until the wreath was completely wrapped (maybe 4 or 5 strips?). I then used three strips to make large burlap rosettes. I glued them onto the wreath. I cut the doily in half and glued one half to to the sides of the rosettes. My mom has a summer place in Wisconsin and the colors are yellow and blue so I used those colors in her wreath. Or with two near the top! Also.... Please, please grab my button! I will be doing a linky party wrap up featuring my favorite posts on Thursday. Thanks so much! That is SERIOUSLY cute! I LOVE the colors, but especially love that you can switch them out! I'm always thinking of making a wreath for some holiday whatnot but never do it in time, with this I could just switch out rosettes to match the holiday! LOVE THIS! Thanks for sharing ... and for hosting! So cute! Happy Mother's Day! You did a beautiful job on your wreath! Thanks for sharing and thanks for hosting! Linked up a wallet/gift card holder craft! Thanks for inviting me to your site and link party. What beautiful, fun projects you have here! totally meant to link up after your comment on my blog! Maybe next time! Love all the projects and your sweet wreath!